(Dubuque, Iowa) April 10, 2012—LabStrong has released economical deionization pretreatment kits compatible with various water purification systems including Fi-Streem Stills. 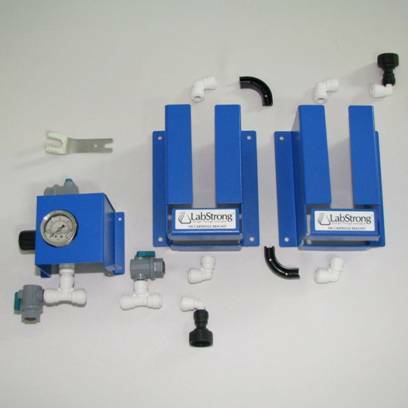 The easy to install kits allow for customization based on inlet water quality and existing purification system plumbing. When asked why the kits were added to the portfolio Tim Gerhard, technical service manager of LabStrong, said, “We received many requests for easy to use kits that decrease the frequency of cleaning a distillation system while producing consistent product water flow rate and purity." Single and dual cartridge holder versions are available. Each includes a pressure regulator/gauge assembly protecting against excessive water pressure and providing for more consistent flow rates. Multiple flow regulation valves, various plumbing fittings and tubing support easy integration for new installations as well as upgrades to existing systems. The dual version better accommodates varying inlet water contaminants and provides extended cartridge service life for point of use DI water systems. Significant reductions in operation costs are achievable when used as pretreatment to a point of use DI water system. Cartridges come sealed with fitted plugs and then in a military specification foil bag ensuring exceptional quality throughout two-year shelf life. For those concerned with a potential leak from a new or existing product that uses water, LabStrong now offers a battery powered leak detector kit. The accessory automatically alarms and shuts off water supply upon leak detection. Included with the leak detector kit are multiple daisy-chainable leak detection probes, various plumbing fittings and tubing. Founded in 2007, LabStrong is the supplier of popular laboratory products including the Fi-Streem water distillation family, Helix family of shakers, water purification cartridges and other OEM products. The company’s mission is to design and manufacture innovative laboratory equipment, focusing on product development for tailored high quality lab equipment applications. LabStrong develops concepts into functional, marketable products by listening and responding to customers unique performance requirements.